Every person who has a PF account is allotted with a unique 12-digit account number by the Employee Provident Fund Organization (EPFO). Universal Account Number (UAN) allows you to access, check and withdraw from the Provident Fund account. So, let us see the procedure of how UAN is activated. Visit official Portal https://unifiedportal-mem.epfindia.gov.in/memberinterface for successful UAN login. Then, choose the UAN Activation link to Submit. Next, enter the PIN and enable the declaration for the applicant to submit the form. Now you will need to create the password. The password should be Alphanumeric, with 1 capital letter, 1 special character and should be of 8-25 character long. Next step is mobile number authentification, you will get the authentication PIN to your registered mobile number. If the mobile number is already registered, you can retrieve the password if you have forgotten the password. Then, select any one of the above options, enter your name, Date of Birth(DOB), mobile number and email ID. Next, fill the login form and now enter the 4 required details. The above process is for the complete registration and activation of the UAN member portal. 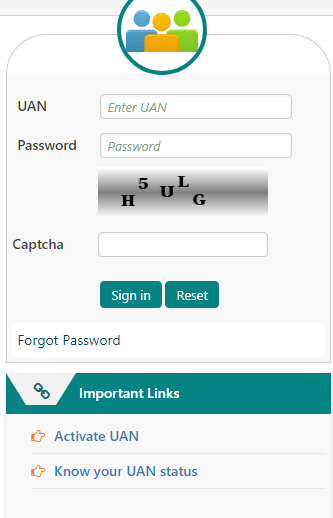 To access the UAN portal, you have to give UAN as log in ID and use the given password. After the login, you will see the following dashboard. The UAN dashboard gives all the online facilities of the EPFO. It has made the operation of EPF transparent. Passbook. Here, in this option, you cannot view the passbook you need to go to the old website of EPFO and view it. This ends our post. If you have any queries or doubts regarding this post, drop them in the comment section below. Related: How to generate UAN using Aadhar? In my profile Service history doesnot show any content.Why is it so?